Grant the O Lord eternal rest / and let light perpetual shine upon them. Greater love hath no man that this / that a man lay down his life for his friends. Cold Ash War Memorial – Dedication Service, 16 Feb 1919. One of the first memorials to be erected in the locality to the memory of the fallen dead in the great European war was unveiled at Cold Ash, on Sunday last, in the afternoon. Unfortunately the weather was very inclement, preventing many from attending the service. The memorial, which is erected in the Churchyard, at the eastern end of the church in full view of the passers-by from the roadway, consists of a dark oak cross, upon which is a finely carved figure of the Christ, protected by an oaken canopy. Below the figure are four oak panels, the two centre ones containing the names of the fallen men belonging to Cold Ash parish. The outside panel in the left has this inscription: "Of your charity pray for the souls of those who from the parish have laid down their lives for their King and country in the Great War." The opposite panel is inscribed thus: "Grant them, Lord, eternal rest, let light perpetual shine upon them." Along the base of the memorial is written the text "Greater love hath no man that a man lay down his life for his friends." The names of those fallen are as follows:- Alfred Charles Ashfield, John Austin, MM, Charles Barr, Charles Edwin Camfield, Henry Leonard Dance, William Roberts, Aufrere Dawson, Lt-Col, DSO (3 bars), John Joseph Flack, Charles Garrett, George Edwin Godwin, William Godwin, Peter Goodchild, William Hamblin, Edward Frank Little, John Lewendon, Charles James Middleton, Walter Henry Palmer, Henry Pearce, Gilbert Povey, Charles Scouse, Arthur Shelton, Sidney Shelton, Bertram Cecil, Metcalfe Smith, Lieut Horace Arthur Furner, Reginald Wells, John Wernham, Frederick Withers, Edwin Middleton Gilbert, Harry Batten, William Jethro Wallen. The larger part of the dedication service had to be held in the church. The Vicar, the Rev W S Grindle conducted the recital of the Lord's Prayer and suitable collects, Revelations 9 was read by Mr Dawson, the singing of the hymns and psalms was led by the choir of Thatcham Church, Mr G J Fyfield, ARCO, providing at the organ. The Vicar of Thatcham, the Rev E Chamberlain gave a short address, during which he said: "This afternoon our thoughts are fixed with our fallen friends, whose lives were bound up with your life. Friends to whom came the call of God and they went forth to do His bidding. To them we owe a great debt. It is not much we can do. We can never repay those who laid down their lived for us. We are met to-day to dedicate a memorial which is as fitting as man can devise. 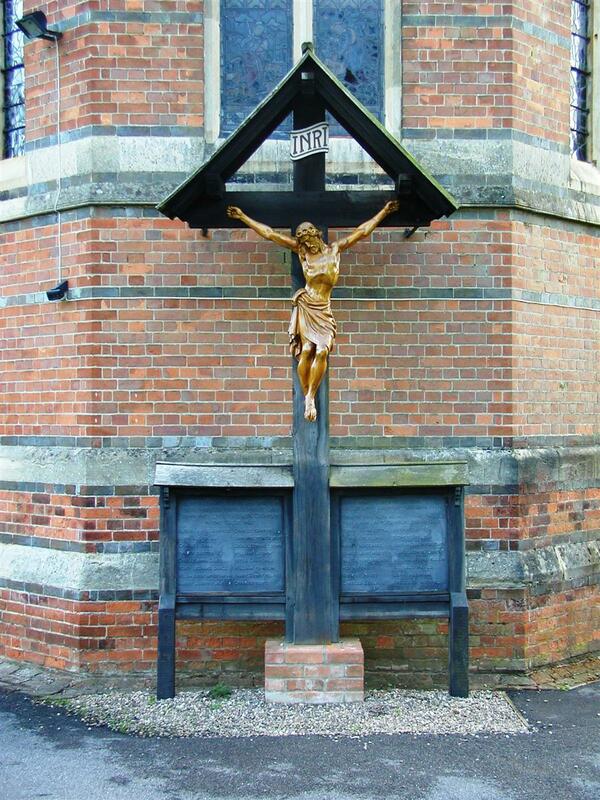 Very quickly the people of Cold Ash have set out to do what they could in erecting this beautiful crucifix. The judgement of the future will be that there could be no more fitting memorial that that of the Saviour in the supreme moment of His great sacrifice, to perpetuate the memory of those who freely laid down their lives. We enjoy what they fought and died for. Through them we have victory and the blessings of peace. The memorial will stand in the gaze of all who pass by. They will look upon that figure and will be reminded of those who have not shrunk to follow in the footsteps of their Master, even to the yielding of life, and as they look they will be encourages to follow Him more closely and will remember that He is on the cross no longer, but has passed to the first fruits of victory, which shall also be theirs and ours if we follow him." After the address the choir led the congregation in procession into the churchyard, where a hymn was sing, the figure unveiled and dedicated "in memory of the fallen and to the glory of God," by the Vicar of Thatcham. The memorial was prepared and erected by Mr Burges of Cold Ash. The figure was supplied by Mr Stallwood, architect, of Reading.